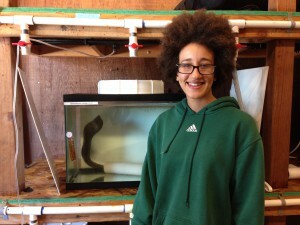 My name is Amber Diluzio and I am currently a fourth year, marine biology major at UCSC. I enjoy scuba diving and really anything that involves being near the ocean. Currently I am working on quantifying maximum prey size in California morays, G. mordax, paying specific attention to their feeding performance and specific behaviors that may occur during feeding. I am also helping out with another project trying to feed baby snowflake morays out of water. I don’t have any definite plans yet for the future, but I hope to continue doing research and see what opportunities may arise.